After all the heat and humidity we’ve endured over the summer, this past weekend we received a welcome reprieve. Especially Saturday. Warm sun, light breezes, pleasant temperatures. 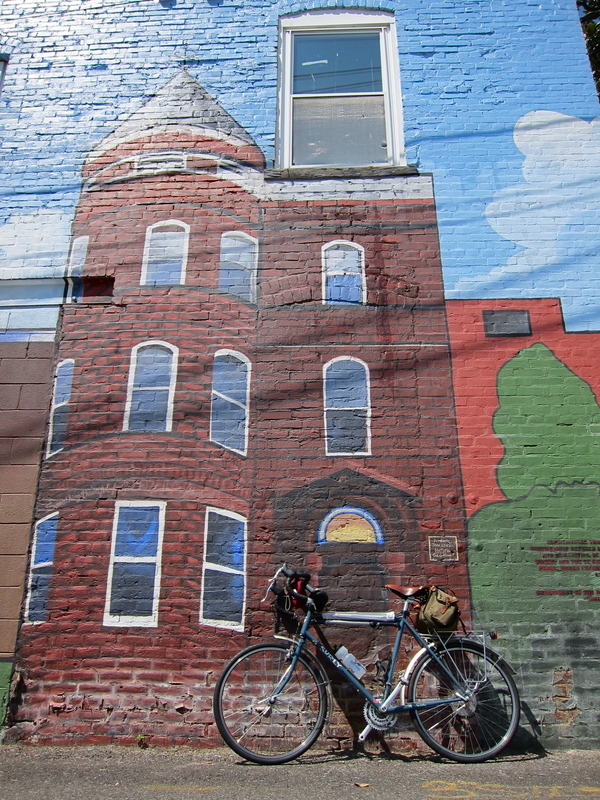 Far too gorgeous of a day to stay inside, Felkerino, his daughter, and I joined BicycleSPACE’s mural ride to see where it would take us and to simply enjoy the day. We weren’t the only ones with this idea. 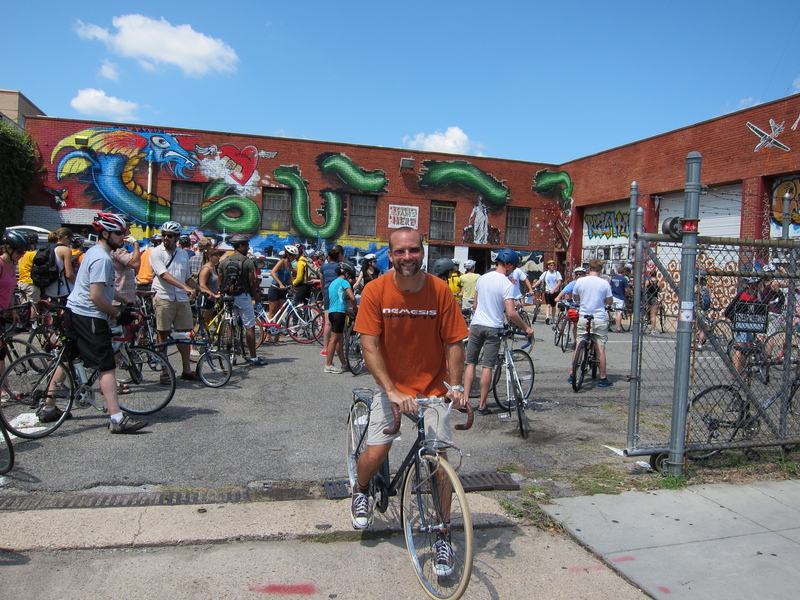 A large group of locals assembled at BicycleSPACE’s shop to take part in the ride, which toured approximately 25 murals located in various parts of the city. 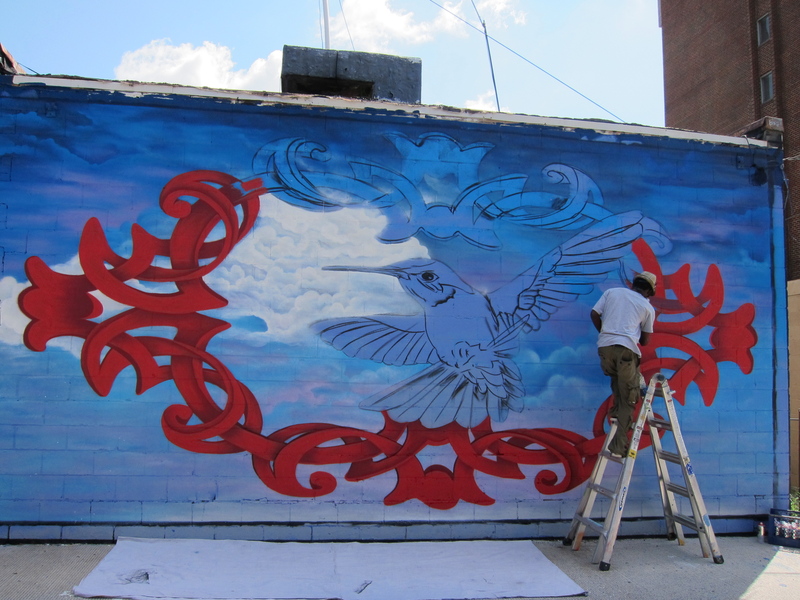 Who knew D.C. had so many murals? Not me! Apparently, many of these murals are “new” (2007 and up), as a result of the efforts by Murals DC, which secured funding and arranged space for the creation of more than 30 murals in the District. The BicycleSPACE organizers and the Murals DC spokespeople treated us to a tour of the murals, many of which are located in nooks and crannies of the city that I would never have thought to explore. Alleys opened up to walls of artwork. Artists had drawn beautiful works on out-of-the-way side streets. Other murals were more prominently positioned. Even so, without the BicycleSPACE ride, I would never have thought to go out and find them. We paused at almost every mural, and one of the members of Murals DC would explain a little bit about the artist and/or the work. Education AND bike riding. On a Saturday, even! 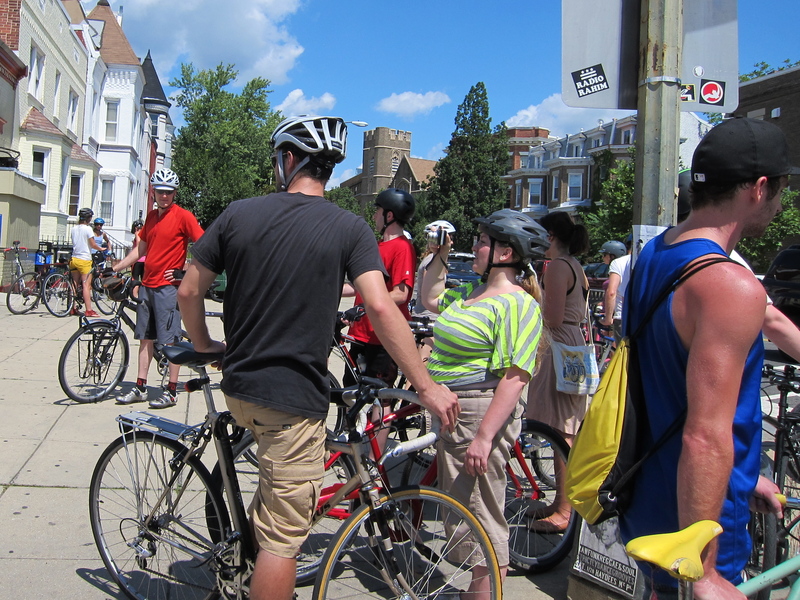 BicycleSPACE does a great job of bringing the #BikeDC community together through its group rides. Also, a moment of bliss subtly emerges at some point on every ride I’ve done with them. Strange, but true. On this ride, it happened as a small group of us watched an artist work quietly on his mural. The artist painted, we paused in the driveway in front of his mural, and quietly watched. Peaceful. Sunny. Perfect. Artist at work on one of the DC Murals. Location: Driveway off 8th Street NW. This BicycleSPACE ride would not fall into the “workout” category. My computer showed that I averaged just over 3.2 miles per hour for our 10 mile jaunt. I believe that might have been my moving average, but even so, I had many moments where I was impressed with how slow I could turn the pedals and remain upright on my bike. This ride was obviously not about aerobic activity. It was put together for us to meander, explore the various artworks, and soak up the sun. I loved this section of mural. So did the Surly LHT. 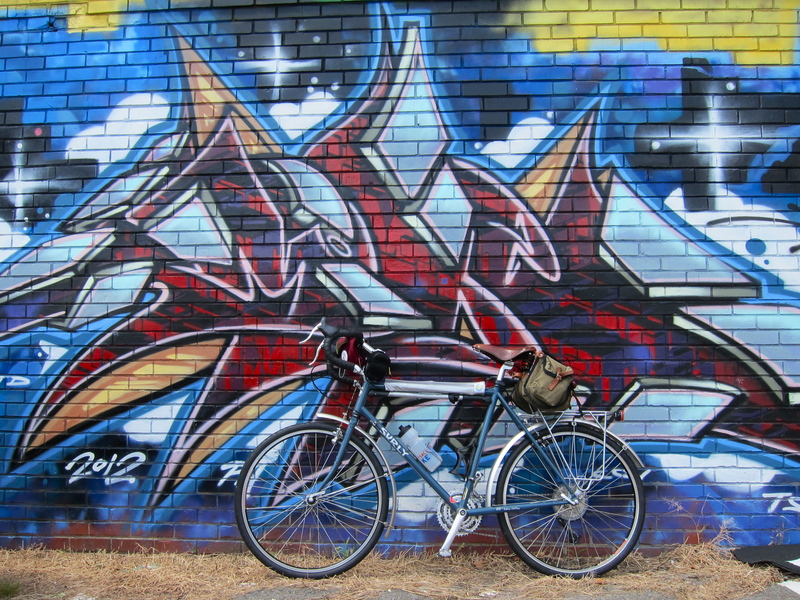 In case it isn’t evident from the photos, my Surly Long Haul Trucker was my mural tour steed. Around town, it’s hard to imagine riding anything narrower than 32s. With speed of no concern and the bumpy D.C. streets to contend with, the Surly was an excellent choice. I was intent on participating in the full ride, but Felkerino’s stomach had other plans, and we peeled off from the group after 14 or so murals to grab lunch. Fortunately for me, BicycleSPACE provided riders a cue sheet, which means I can go back and complete the tour of the murals I missed some other time. What did one wall say to the other wall? Meet me at the corner. Felkerino’s “I met you at the corner and I need to eat now or else” look. I ended up riding with a few new people on this ride, including Phil, one of the BicycleSPACE owners. We also talked a little bit with Erik, another one of the founders of the shop. I wish I had an opportunity to meet more riders on these rides, but with all of the maneuvering through the city (in traffic) it doesn’t always work out that way. 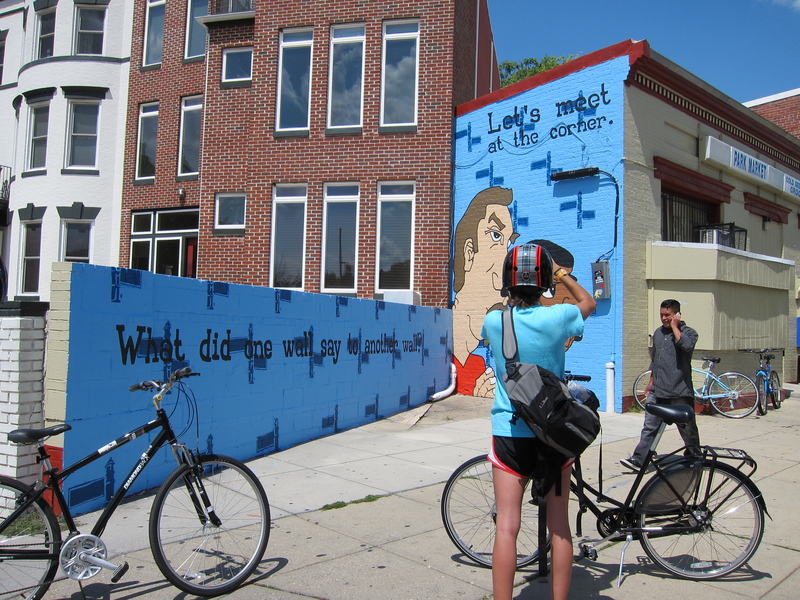 Thanks so much to BicycleSPACE for organizing the ride, and to Murals DC for putting art in public spaces. The city is more inviting bathed in splashes of color instead of drab concrete and brick. 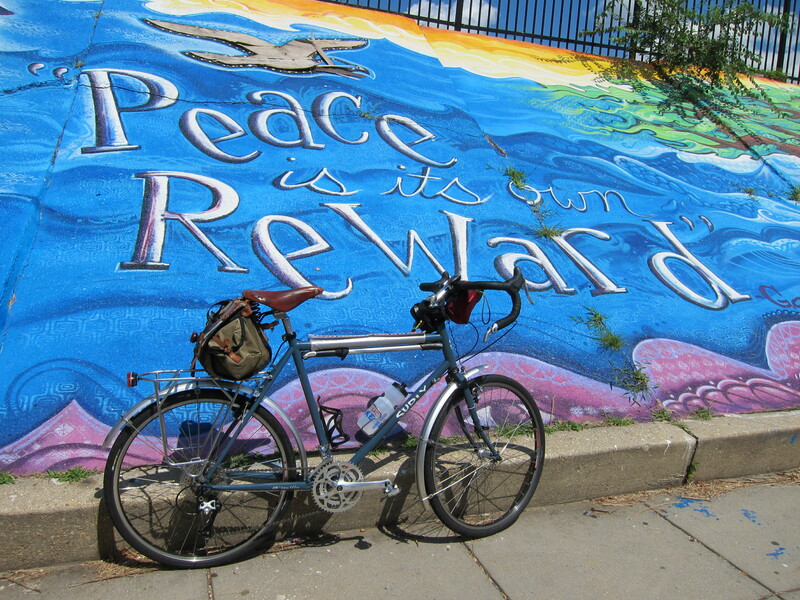 More pics of the murals and the ride can be found here. By the way, if you have suggestions for murals in the D.C. area that you think are worth a look, would you please let me know in the comments where I can find them? I want to see more murals! 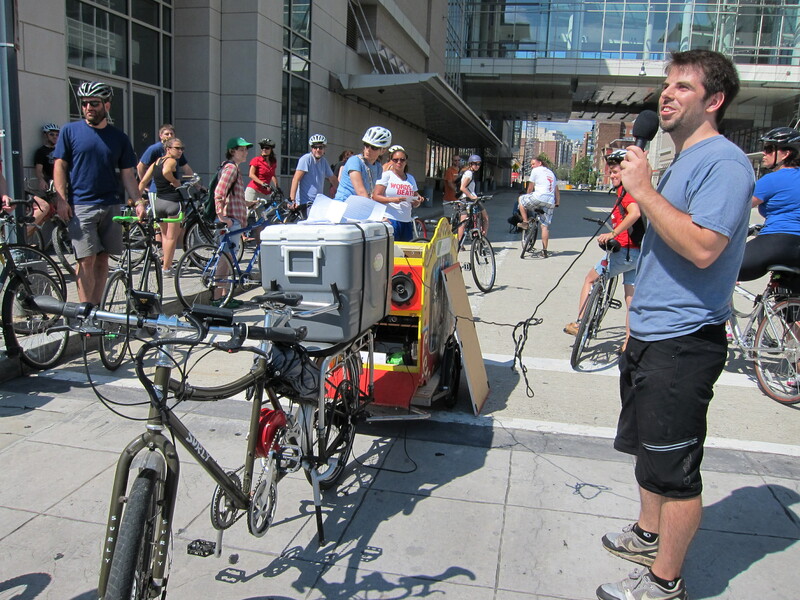 Great post – looks like a fun ride (unfortunately I wasn’t able to make it for either mural ride). Some of these are familiar but I’m interested in checking out the others. Any chance you know if there’s a route map/cue sheet online? Great finds. I love murals in the city! And it truly was a perfect day for a bike ride.